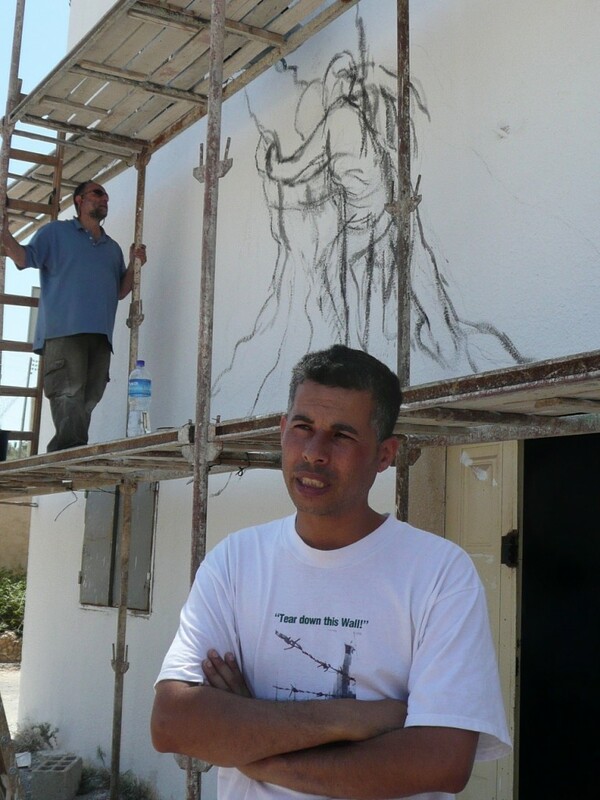 Since 2005, the people of Bil’in have been leading protests against the construction of the Wall in their village, with participation from Israeli and international activists. The construction of the Wall has resulted in the de-facto annexation of 2,400 dunums of land (600 acres) - over 50% of the land belonging to the village facilitating massive Israeli settlement expansion east of the Green Line. The 3rd Annual International Conference on the Joint Popular Struggle. 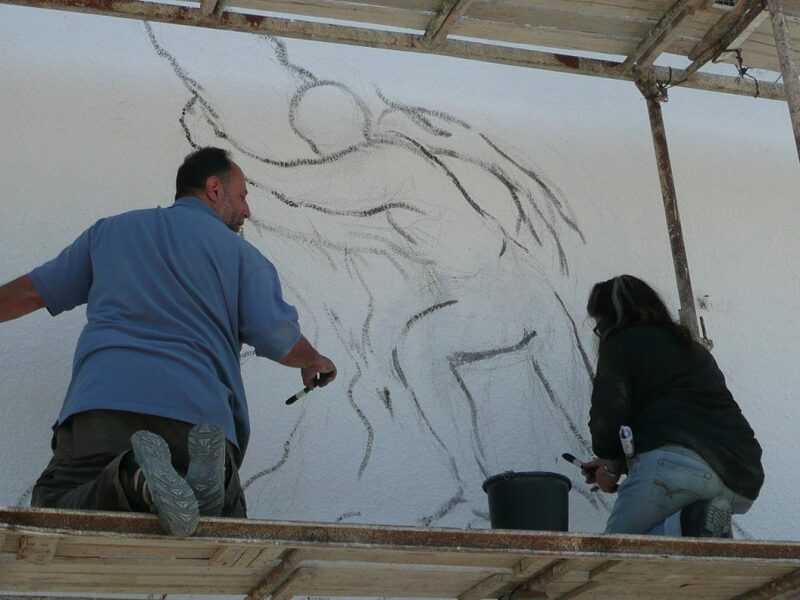 The image chosen for the Conference is a cartoon by Palestinian cartoonist Naser Al Jafari that appeared in Al Quds newspaper after an action in which the people of Bil’in chained themselves to the olive trees, that were slated to be uprooted (for a video of this action click here). It shows the tree and protestor in an embrace. 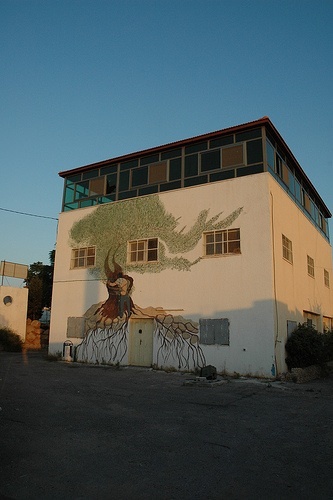 While our original idea was to paint something on the ‘outpost’ the villagers built on their land which lies on the other side of the Wall in protest of the illegal Israeli settlements being built on their land, the Palestinians in Bil’in preferred that we paint in a more visible building in the village. 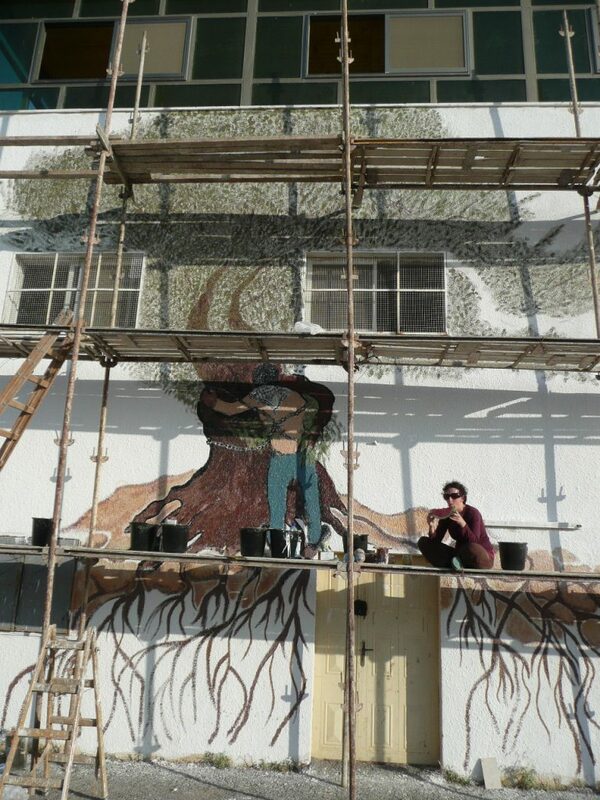 So worked to finish a mural on the village council building in before their annual conference. John Halaka and Nancy Hernandez. Nancy was on a Witness For Peace delegation for activists and just happened to be in the area! She stopped by to help us! Six years have passed since residents of Bil'in, together with their Israeli and international supporters, started regularly demonstrating against the Wall and the confiscation of more than half their land by it. It has been more than three years since the Israeli High Court ruled that the path of the Wall must be changed as soon as possible, and the people of Bil'in have waited long enough. 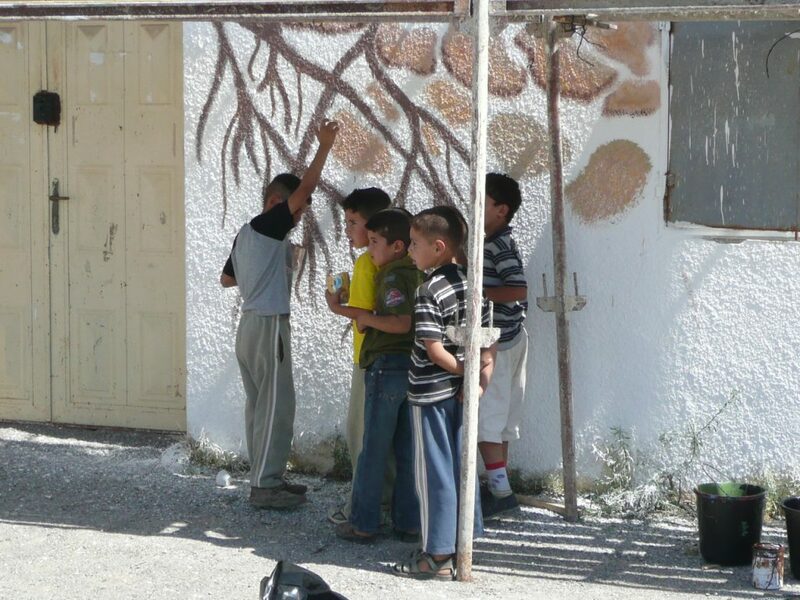 To Learn more about Bi'lin and to support their efforts please click on the following links. We visited the village of Bil’in today and met with Mohammed Khatib and Eyad Bornat from the Popular Committee against the Wall. Youth from the neighborhood came out to watch our progress and to help paint. Susan Greene and John Halaka working out the design. Lisa Nessan taking a break and eating delicious watermelon. Bil'in Friday 17.6.2011 demonstration against the separation barrier cutting the village's land in half, against the occupation and against apartheid. Jenin's Freedom Theatre took part in the demo and performed by the gate.